United Thank Offering, often referred to as UTO, is a ministry that provides a way for men, women, and children of the Episcopal Church to give daily thanks to God. The discipline starts in the home by dropping coins into a special container known as the Blue Box. 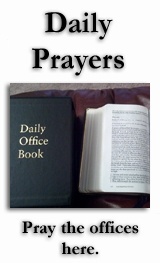 Many folks drop a coin in the Blue Box each time prayers of thanksgiving are offered. At specific ingatherings during the year, individuals and families bring their Blue Boxes to Saint Luke's, and funds collected from across the country are forwarded to UTO. 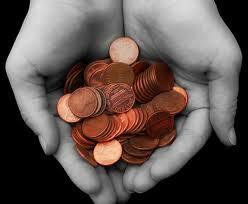 People generally do not value individual pennies, and in fact some people actually discard them. According to the latest data available, 14.6% of households struggle to put food on the table. Approximately 1 in 4 children are at risk. More than 35% of school age students receive free or reduced price school lunches because their families are considered low income or live in poverty. The mission of Pennies for Hunger is to end hunger. When ordinary Christians come together to reach a common goal, we can end hunger for good. Save your pennies, and at Saint Luke's annual ingathering for Pennies for Hunger you will be amazed at how pennies add up!